Alternative Minimum Tax (AMT) – The AMT is not annually adjusted for inflation. The 2015 exemption amounts are $53,600 for individuals and $83,400 for married couples filing jointly. Taxpayers most vulnerable to AMT are those with income over $75,000 and some large deductions such as – several children, interest deductions from second mortgages, capital gains, high state and local taxes, and incentive stock options. Deductible Medical Expenses – Taxpayers who itemize can deduct medical expenses that exceed 10% of their adjusted gross income (AGI). If either the taxpayer or their spouse were age 65 or older as of December 31, 2014, the threshold is 7.5% of AGI. Starting in 2017, the 10 percent of AGI threshold applies to everyone. Payments for transportation, primarily for and essential to medical care, qualify as medical expenses at the rate of 23 cents per mile in 2015. Employer Plan Contribution Limits – The contribution limits for employees who participate in 401(k), 403(b), most 457 plans, and the federal government’s Thrift Savings Plan increased to $18,000 in 2015. Employees can make an additional $6,000 catch up contribution if over age 50. Employee contributions needed to be withheld from paychecks during the calendar year. The maximum compensation used to determine contributions increased to $265,000. Estate and Gift Taxes – The maximum tax rate is unchanged at 40%. However, the exclusion amount was increased to $5,430,000. The annual exclusion for gifts remains at $14,000. Health Savings Accounts (HSAs) – HSAs are pretax accounts used for paying qualified medical expenses pretax. Contributions to these accounts may be tax deductible. To qualify, the taxpayer must be covered by a High Deductible Health Plan (HDHP) and not be covered by other health insurance with the exception of insurance for accidents, disability, dental care, vision care, or long-term care. The deductible must be at least $1,250 for individual or $2,500 for family coverage in 2015. Individuals can contribute $3,350 ($4,350 if age 55 or older) or $6,650 for family coverage ($7,650 if age 55 or older). The deadline for making contributions is April 15, 2016. Income tax for children – children under age 18 (or a full-time student under the age of 24) with unearned income are subject to tax at their parent’s tax bracket. The amount that can be used to reduce the net unearned income reported on the child’s return subject to tax is $1,050. The net unearned income for a child that is not subject to “kiddie tax” is $2,100. IRAs – The maximum IRA contribution remained at $5,500 in 2015 ($6,500 for those over age 50). Eligibility income levels increased with inflation. Deductible IRAs can be made by single taxpayers and heads of household who are covered by an employer-sponsored retirement plan and have modified AGI less than $61,000. The phase-out range is between $61,000 and $71,000. For married couples filing jointly, in which the spouse who makes the IRA contribution is covered by an employer-sponsored retirement plan, the phase-out range is $98,000 to $118,000. For taxpayers who are not covered by an employer-sponsored retirement plan and are married to someone who is covered, the deduction is phased out if the couple’s modified AGI is between $183,000 and $193,000. 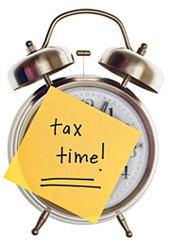 The deadline to make an IRA contribution for 2015 is April 15, 2016. Long-Term Capital Gains and Qualified Dividends – The tax rate remains the same but the income levels have been adjusted for inflation. The tax rate is 0% for taxpayers in the lowest two brackets (10 & 15 percent). Taxpayers in the middle tax brackets (25, 28, 33, and 35 percent) pay 15%. Taxpayers in the highest tax bracket with income above $413,200 ($464,850 married filing jointly) pay 20%. The Medicare surtax on investment income also applies to the amount of capital gains or dividends exceeding the income thresholds. Medicare surtax – The additional 0.9 percent Medicare tax on wages above $200,000 for individuals ($250,000 married filing jointly) remains in effect for 2015. The income thresholds have not changed for inflation. The 3.8% Medicare surtax percent on investment income applies to taxpayers at the same income thresholds. Pease and PEP Phaseouts – Pease (limitations on itemized deductions) and PEP (personal exemption phase-out) income thresholds have been raised with inflation. Taxpayers with income at or above $258,250 for single filers and $309,900 for married filing jointly are affected. Roth IRA – The maximum Roth IRA contribution is the same as a Traditional IRA. The income threshold increased to $183,000 to $193,000 for married couples filing jointly. Single taxpayers and heads of household, the income phase-out range is $116,000 to $131,000. The deadline for making contributions is also April 15, 2016. Saver’s Credit – the AGI limit for the saver’s credit for low and moderate income workers increased to $61,000 for married couples filing jointly; $45,750 for heads of household; and $30,500 for married individuals filing separately and for singles. The credit is available to those with qualifying income for contributions to IRAs, Roth IRAs, and/or employer sponsored plans. The AMT still affects millions of taxpayers but the exclusion levels are now indexed to inflation each year. Obamacare limited the amount of medical deductions to only the amount that exceeds 10% of AGI for taxpayers under age 65. Retirement plan contribution limits increased for employer sponsored plans but remained the same for IRAs and Roth IRAs.